WILL MY RESULTS BE EXACTLY THE SAME AS GIBSON TEST RESULTS? WHY IS GIBSON THE BEST EXHAUST SYSTEM? WHAT KIND OF PERFORMANCE GAINS CAN I EXPECT? IS THERE ANY WELDING REQUIRED? HOW LONG DOES IT TAKE TO INSTALL AN EXHAUST SYSTEM? HOW DO I KNOW IF I'M BUYING A REAL GIBSON PRODUCT? DO I NEED TO MAKE ANY MODIFICATIONS OR BUY ADDITIONAL PARTS TO INSTALL THE SYSTEM? CAN I INSTALL A GIBSON SYSTEM MYSELF? Q: WILL MY RESULTS BE EXACTLY THE SAME AS GIBSON TEST RESULTS? Q: WHY IS GIBSON THE BEST EXHAUST SYSTEM? 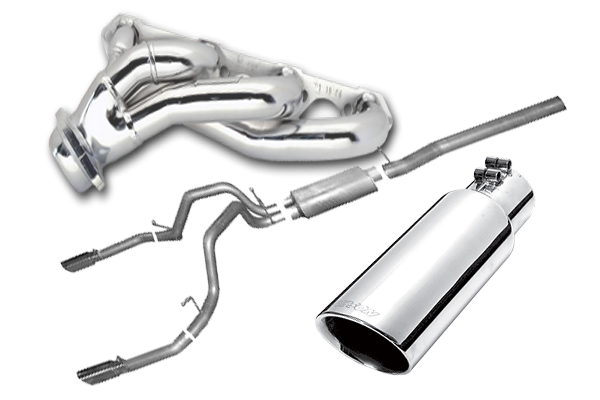 Sample FAQ AnNothing performs better, looks better or sounds better than Gibson performance exhaust. Our research and development team invests many hours to ensure our products stay competitive and perform the way they should. Quality, value and technology! 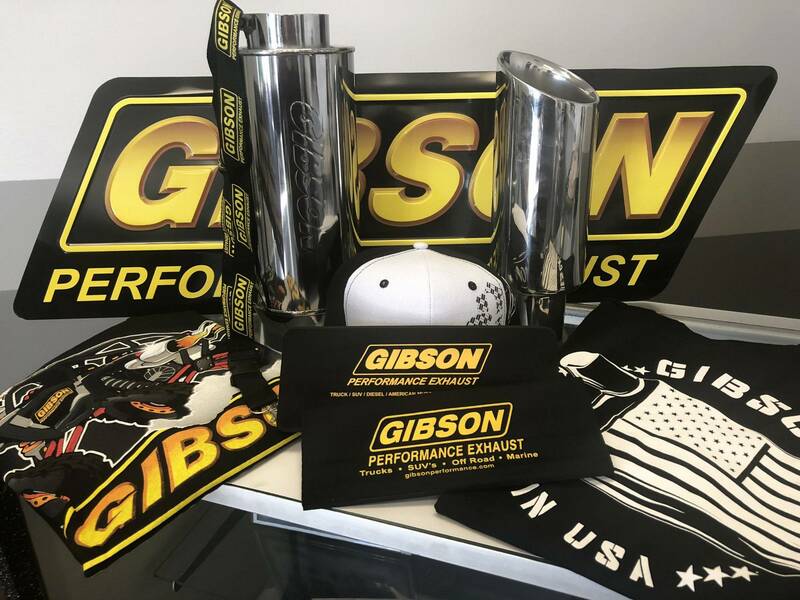 Gibson is committed to the development of state-of-the-art exhaust products that improve the performance and the sound of your vehicle. Q: WHERE DOES THE POWER COME FROM? There is a 34% (or more) exhaust restriction in the typical stock muffler. 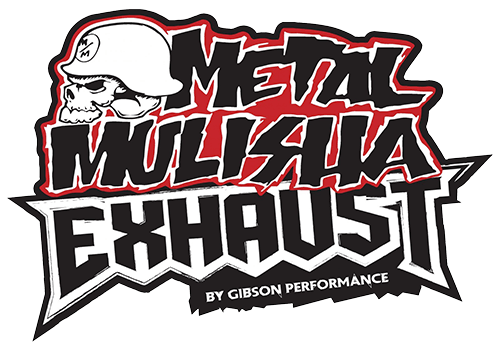 Gibson Superflow mufflers only have about a 5% restriction because we "custom power tune" every muffler specifically to each vehicle. 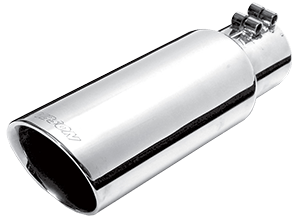 Other brands of aftermarket mufflers have between a 20% and 20% restriction. That is why Gibson consistently outperforms the competition on laboratory "flow bench tests" and, more importantly, when you want hill climbing, stump pulling power and torque! Another contributing factor is the mandrel bent pipes we use. Through "mandrel bending" the opening diameter of the pipe is kept constant, even through the bends. 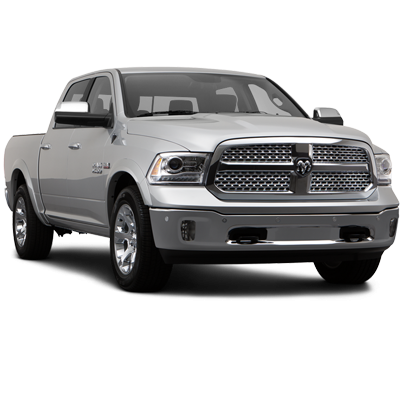 This consistent opening size allows the exhaust pulse to flow smoothly without power robbing restrictions or backup. Q: WHAT WILL IT SOUND LIKE? 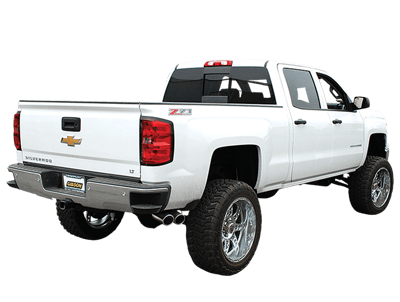 Our products are designed and tested on stock vehicles to meet legal sound limits, with the exception of our Super Truck Exhaust. If other products are installed the overall combined effect may exceed the allowable limits. Every Gibson system is engineered to provide a civilized tone. In most cases, this will be moderately louder than stock, but with a rich throaty tone that is pleasing to the ear. Each Gibson system is quieter in the cab than any other competitive. You will get the big-block sound at the tailpipe, where it belongs. No annoying sounds, vibrations, hiss or rumble in the vehicle so common to other systems. Socket set, wrench set, and a hacksaw. Q: WHAT KIND OF PERFORMANCE GAINS CAN I EXPECT? Gibson cat-back systems deliver performance and increase torque that you will feel, with improved acceleration, hill climbing and passing power. Typical performance gains on fuel injected V-8 will be anywhere from 10-25 horsepower and similar numbers for torque. For V-6 applications you will see a gain of 10-15 horsepower. How much performance you gain will depend on the condition of your vehicle and the upgrades you have already made. Q: IS THERE ANY WELDING REQUIRED? No. Everything is designed as a bolt-on kit. Q: HOW LONG DOES IT TAKE TO INSTALL AN EXHAUST SYSTEM? Most exhaust installations can be completed in about 1/2 day. Headers can take a little longer. Q: HOW IS GIBSON DIFFERENT? POWER... GIBSON delivers its power in the 2,000 to 4,000 rpm range. Other competitive systems claim more power by using the higher 5,000 to 6,000 rpm range... This rpm range is never used by street vehicles. SOUND... GIBSON is "quieter in the cab" than any other competitive system. You get the big-block sound at the tailpipe, where it belongs. No annoying hiss or rumble in the vehicle so common to other systems. 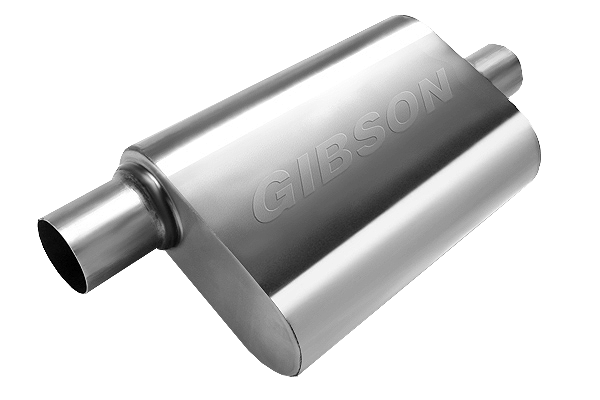 The thicker materials used in both the muffler case and the exhaust piping, as well as our patent pending "flow tuning" chambers in every Gibson Superflow™ muffler keeps the sound "in the system" until it exists at the tips. Q: HOW DO I KNOW IF I'M BUYING A REAL GIBSON PRODUCT? Every Gibson muffler built has the Gibson name embossed in the case. If it doesn't say Gibson on the muffler--beware, it's not a genuine Gibson muffler. HOW DO I GET THE MOST POWER Maximum engine power can be released by adding Gibson headers to any of the Gibson cat-back systems. Maximum engine power can be released by adding Gibson headers to any of the Gibson cat-back systems. Yes, GIBSON does sponsor vehicles. Please submit our application form found on the website. Q: DO I NEED TO MAKE ANY MODIFICATIONS OR BUY ADDITIONAL PARTS TO INSTALL THE SYSTEM? No. Our systems are designed to be completely bolt-on to your vehicle. Factory locations are utilized and all necessary installation hardware is included in the kit. Q: CAN I INSTALL A GIBSON SYSTEM MYSELF? Yes, many of our customers enjoy installing their Gibson system. In fact, we are told that it's a tougher job to remove the stock system than to install their Gibson exhaust. Q: CAN AN AUTOMOTIVE DEALERSHIP VOID YOUR WARRANTY? Your have the right to buy high-quality, reliable aftermarket performance parts - an affordable and convenient alternative to the vehicles maker's parts. You have the right to use high-quality aftermarket parts and know that your new car warranty claims will be honored. In fact, your vehicle dealer may not reject a warranty claim simply because an aftermarket product is present. A warranty denial in such circumstances may be proper only if the aftermarket part cause the failure being claimed. You have the right to patronize independent retail stores for vehicle parts and installation. The U.S. aftermarket offers the world's finest selection of aftermarket products that satisfy the most discriminating customers seeking personalized vehicles for today's lifestyle.